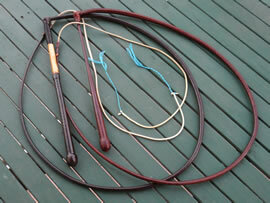 Traditional Australian Stock Whips offer an unbeatable design for accuracy and control. They will provide a crack second to no other whip. Stockmen and drovers have used the Stock Whip throughout Australia since the early 1800’s and it is still the preferred whip used by Australian cattlemen and women today. The design of the Stock Whip is perfectly suited and has been refined for use on horseback while working cattle and stock. Although it is a rugged working tool the Stockwhip is also ideal for target work or multiple cracking. It’s the ultimate all rounder. All Stock Whips in the range are handcrafted by Si Davey, using only superior quality kangaroo hides. 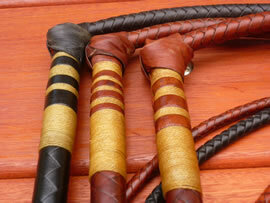 Each whip is hand cut and crafted by Si, following the centuries old techniques of the master craftsmen and features the traditional two-in-one design and twenty inch stock. We here at Si Davey Whips have decided to add this new line due to the huge demand for the traditional 12 plait kangaroo hide whip. 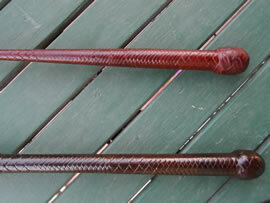 The stocks, or handles, of our new Traditional Stock Whip line come in half plait or full plait. 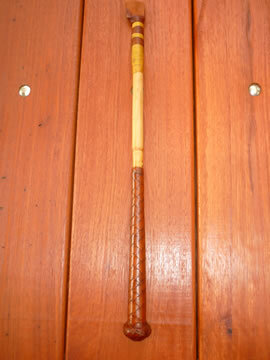 The full plait has either a steel lined cane or solid fiberglass stock. The plaited bellies are double bolstered with two grades of leather. 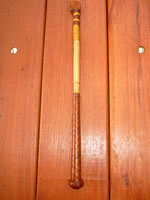 At the moment, we are offering The Traditional Stock Whip in a single colour only. 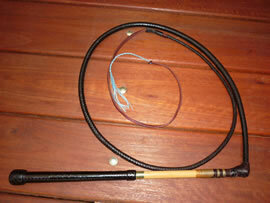 A two tone version of The Traditional Stock Whip is a custom option. 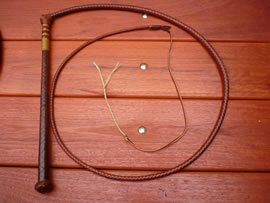 The Traditional Stock Whip lengths are 6 foot, 7 foot or 8 foot. 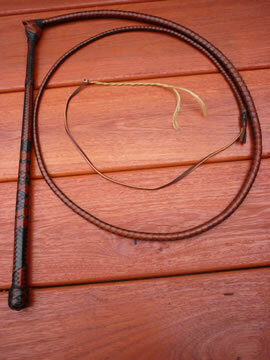 A longer whip may be ordered and would be a custom order. 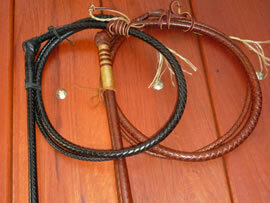 These whips are totally handmade by me as are all my whips. There is no off shore work or bought in parts. I personally thumbnail cut and eye ball every single piece of my product. Please note: Postage and Handling of $25 plus GST on the total will need to be added. 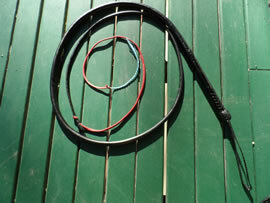 I would like to introduce a new range of Si DAVEY whips for the working stockman. 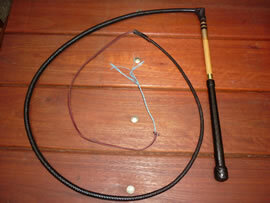 First is the Burke and Wills stockwhip; a no nonsense whip 6 foot 6 x 8 , all cane handle fully plaited over. 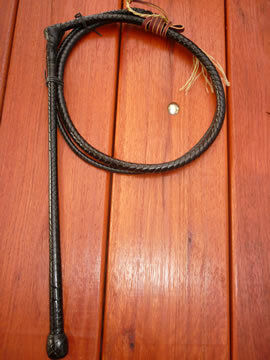 This stockwhip has heavy waxed whipping on the keeper and a durable turban style Turks Head to complete the stock. These stockwhips are to the design of ones I saw in my childhood. They are in one colour only. 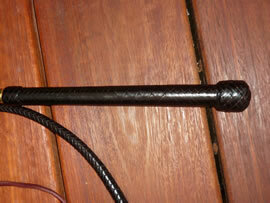 Second is the Flinders full plait stockwhip which is also 6 foot 6 x 8 in one colour. The difference is the stock is in solid fibre glass. The Turks Head is a standard 5 x 4. The final new line is the Roustabout stockwhip. This is the also 6 foot 6 x 6 in one colour but is a half plait traditional style stockwhip with the traditional tapered handle. by Si Davey…please order in plenty of time….. these are wholesale prices. By the way, here are some photos of a DROVER stock whip which is a 6 ft , 8 x 12 roo hide whip that I made for one of our customers very recently. Thought you'd like to see it.